Chinedum Ndukwe during his tenure at Notre Dame. Chinedum "Nedu" Ndukwe (pronounced CHIN-eh-doom n-DUQUE-ay) (born March 4, 1985) is a former American football safety. He was drafted by the Cincinnati Bengals in the seventh round of the 2007 NFL Draft. He played college football for the University of Notre Dame. He also played for the Oakland Raiders. 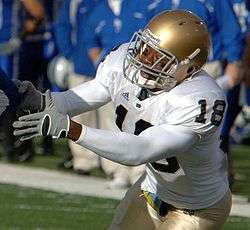 After graduating from Dublin Coffman High School, Ndukwe went on to start as safety for the University of Notre Dame for his junior and senior seasons. He played in 46 games with 25 starts and made 157 tackles. During his tenure at Notre Dame, his fellow Dublin Coffman graduate, Brady Quinn, was his roommate. Ndukwe had a double major in Marketing and Psychology. Ndukwe was drafted by the Cincinnati Bengals in the seventh round (253rd overall) of the 2007 NFL Draft. Ndukwe made an immediate impact by playing in 14 games and starting two in place of an injured Dexter Jackson at strong safety. Ndukwe finished the season with 35 tackles, two sacks, three interceptions, six pass deflections, a fumble recovery that he returned for a touchdown, and one forced fumble. He finished the season one of four Bengals to log an entry in every statistical column on the defensive stat sheet for the season. Ndukwe missed the second and third games of the season due to a hamstring injury suffered against the Baltimore Ravens. In a December 23 contest against the Cleveland Browns, Ndukwe totaled two interceptions off quarterback Derek Anderson. His first interception was returned 44 yards to the five-yard line, setting up a Bengals' score. His next interception came off of a pass intended for tight end Kellen Winslow that Ndukwe grabbed in the end zone. He also recorded 12 tackles, which was second-best on the team. In a November game against the Ravens, Ndukwe intercepted a Kyle Boller pass in the end zone in the fourth quarter. In the season finale against the Miami Dolphins, Ndukwe returned a fumble 54 yards for a touchdown that put the Bengals ahead 28-10 in the fourth quarter. After the touchdown, excited commentator Joe Woeste claimed Ndukwe was a future Hall of Famer. He was competing with Dexter Jackson for the starting safety role; however, in 2009 the Bengals cut Jackson, leaving Ndukwe as the starting strong safety. He became a free agent after the 2010 season. After rehabbing a knee injury for 10 months, the Oakland Raiders signed Ndukwe on October 18, 2011. He played in two games with one interception before aggravating the original injury, ending his comeback and his season on November 10. His name "Chinedum" means "God is my Guiding Light" in Igbo. In 2008 Ndukwe attended the Harvard Business School, followed by the Wharton School of Business at the University of Pennsylvania in 2009 for the NFL Business Management Program. Chinedum started the Ndukwe Foundation in 2009 (http://www.ndukwe.org), a nonprofit organization dedicated to enriching the lives of today’s youth by offering solutions and creating outlets to help young people overcome everyday pressures. The foundation seeks to plant seeds of hope in young lives, pushing them to reach beyond their current realities and propelling them toward a future brighter than they ever imagined. The Foundation is based in Cincinnati, Ohio and is currently starting a new branch in his hometown of Dublin, Ohio. Notably, The organization hosts an annual wellness camp for over 300 kids in the Greater Cincinnati Area and has raised over a hundred thousand dollars for programs benefiting youth and their families. Ndukwe also sits on the board of the NuWay foundation, an international organization working to transform the lives and economic conditions of the less fortunate through education,community building and economic empowerment. In 2010, The City of Cincinnati proclaimed February 10 "Chinedum Ndukwe Day" in recognition of the foundation's hard work and his dedication to the city. On January 30, 2012, Chinedum made his voice over debut working for NFL Films as the narrator for ESPN's Hey Rookie. Ndukwe is the youngest of the three sons, his oldest brother Kelechi is a Lieutenant in the United States NAVY and in July 2012, he will report to the Minesweeper Crew SWERVE, based in San Diego as the Executive Officer. The middle brother, Ikechukwu, is an offensive tackle in the NFL who is currently a free agent. His youngest sibling, Ezinne is currently earning her masters in Public Health at the University of Michigan. ↑ "Igbo (Ibo--Nigerian) Names & Their Meanings". Chamaka: African Language & Culture. Retrieved February 14, 2015.